Jet-engined armoured ground attack aircraft. It was a rather odd design, with two engines in the forward fuselage, armoured tandem cockpits, swept wings, and a remote-controlled tail gun turret. Only one was completed, because the concept was clearly outdated. This plane looks like a double-barreled shotgun when viewed from the front. 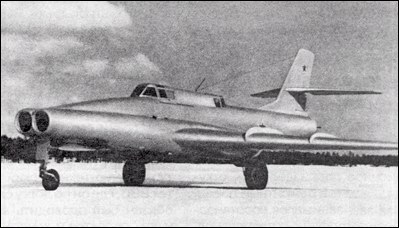 The Il-40 was first flown in March 7, 1953 - already after Stalin's death (just some days, but after). It was cancelled by the Government's order in April 13, 1956 - so Stalin couldn't be involved in this. The Defence Minister Georgy Zhukov decided to abandon Shturmoviks, replacing them by the fighter-bombers. The Shturmoviks returned only about 20 years later. Actually not one, but two Il-40 prototypes were built and the series of 40 aircraft was started before the program cancellation. The project was cancelled due what Stalin was believed what VVS not need a ''Sturmovik'' jet and for that,he was ordered scrap the 5 prototypes .Is possible what survives an unique prototipe of hte plane. Well, it was actually an IL-102, which was derived from an IL-42, itself a derivation of IL-40, that was offered for export in 1992. Funny to see an aircraft with a remotely controlled tail gun and a rear facing gunner on a modern aircraft. This aircraft oddly resurfaced at an arms exhibition in the late 90s, posing as an alternative to the Su-25 and actually for sale to any interested party/airforce.